Appliances have gone from being luxuries to becoming necessities. With busy work schedules and crazy traffic, going out and getting your appliance fixed is not always possible. That’s why HouseJoy brings the convenience of at-home Appliance Repair Service. The summer is over and your AC can finally take a break. Before that, make sure you get a good AC Repair Servicing done to undo all the damage caused by the constant use over the last few months. One forgotten appliance during the summers might be your geyser, which is an important part of the cooler months. With HouseJoy, you can get geyser repair service at home to ensure you don’t get a shock of cold water on a cold morning – unless that’s how you prefer to get instantly awakened instead of a cup of coffee. The more regularly-used appliances like you refrigerator, TV, washing machine and microwave are prone to wear and tear. You refrigerator might not be cooling as well as it did before or it might be making a strange noise. You might also notice a pool of water under your fridge this is not normal. All of these are signs that you need refrigerator repair service at home. It’s easy to assume the role of a repair man and attempt to fix an appliance but when it comes to your TV, you will definitely want an expert to look at it so you don’t miss your favourite shows. Yes sure you can watch programs online, but you can also book online TV Repair service at home so your entire family is not crowded around your computer system. You can try DIY methods to clean your microwave for regular upkeep. However, when it starts emitting smoke, releases a strange smell, stops lighting up or the plate stops spinning, it’s probably time to get it repaired by booking a microwave oven service appointment with HouseJoy. With your TV fixed, and your microwave working like new, you can make a bowl of popcorn, play a movie and enjoy the feel of a mini theatre at home. Another appliance that gets taken for granted is the one tucked away in the corner – quietly doing its work – the washing machine. When yours suddenly becomes not-so-quiet or ends up a few feet away from where it was during a wash, just book a washing machine repair service online to get it fixed in no time. It’s okay to be dependant on an appliance. Especially when you have HouseJoy to help you take care of those appliances so that they can take care of you. 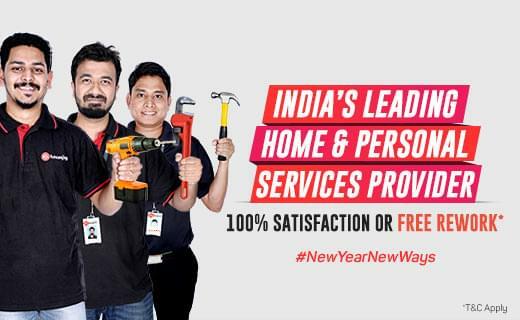 HouseJoy offers installation, repair and all kinds of appliances service in Pune, Mumbai, Bangalore, Delhi, Hyderabad and Chennai. What kind of appliances you ask? You name it and they fix it.